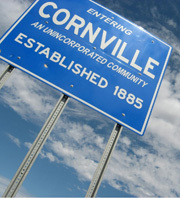 (Cornville, AZ) The names of presidential hometowns have a special ring to them, a sort of geographical charisma or gravitas. There was Hope, Arkansas. Plains, Georgia. Crawford, Texas and Kennebunkport, Maine. Well if John McCain is elected, the world will get to know a tiny town tucked in Arizona’s Verde Valley. It’s where McCain goes for weekend getaways. And it’s not where you think. Listen here. This piece was produced for KJZZ and Weekend America. This story was posted on Saturday, September 6th, 2008	and is filed under All Things Quirky, Life in the Southwest, Politics.